Bolton Interchange is a transport interchange combining Bolton railway station and a four stand bus station in the town of Bolton. The station is located on the Manchester spur of the West Coast Main Line and is managed by Northern. The station is 11 1⁄4 miles (18.1 km) north west of Manchester Picacdilly. 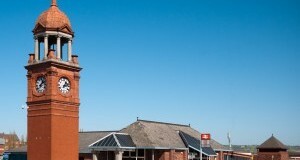 The railway station was originally named Bolton Trinity Street to differentiate it from nearby Bolton Great Moor Street which closed in 1954. The station was also known as “Bridgeman Street Station” and “Bradford Square Station”. The entrance and ticket office are at street level, at which there is a bus interchange and taxi rank. A walkway leads to the platforms which are in a cutting. The main island platform has a buffet. The original main station building was demolished in the 1980s, but the Victorian buildings survive on the platforms. 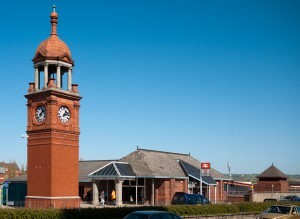 The clock tower was dismantled and rebuilt next to the new station. The station is on the Ribble Valley Line, a local line running north to Blackburn and Clitheroe. There are services used by commuters from Wigan Wallgate and on the Manchester to Preston Line. Recent timetables provide a convenient connection (although a platform change must be made which is not possible for wheelchair users) at Hindley (Wigan, Kirkby and Southport bound trains from Bolton) for certain stations on the Atherton line (Daisy Hill, Hag Fold, Atherton and Walkden). SD 719087 – for a map visit www.streetmap.co.uk and enter the grid reference. To see National Rail’s new station facilities page for this station click here.